A resident of Tsawwassen, Nicola Collicutt was a star athlete at South Delta Secondary School, playing Senior Girls AAA basketball from 2004–2006. She was the team captain when South Delta placed 3rd at the High School AAA Provincial Championship Tournament in 2005. Nicola played for the Delta Heat A Fastball Club from 1999–2004; the White Rock Renegades A Fastball Club from 1999 – present; Team BC, Gold Medal winners at the Western Canada Summer Games; Team BC, Gold Medal winners at the Western Canada Summer Games in 2005; and the White Rock Renegades Senior Women’s Provincial Champions in 2008. In 2006, Nicola proceeded to Simon Fraser University where she completed a four year playing career with the SFU University Women’s Softball Team in 2010. In retrospect, 2010 may perhaps be the most memorable of all her years at SFU. It was then considered that 2010 might be the final opportunity for the very successful program on Burnaby Mountain to advance to the NAIA university women’s national tournament. Starting in 2011, it had been decided that all SFU sports teams would play at the NCAA Division II level. Success beckoned with the SFU Clansmen winning their fourth NAIA crown at the national tournament in Decatur, Alabama in a 4-3 thrilling victory over their long-time rival, Oklahoma City University Stars. It was SFU’s first national championship since 2005 and also the most unexpected. SFU, due to rainouts, had only played 35 games before heading to Decatur as compared to more than 50 for many other schools in the 32-game tournament. Coach Mike Renney stated that nobody he had talked to expected that SFU would emerge as tournament finalists. Nicola Collicutt played excellently in the deciding game of the 2010 national tournament. As starting catcher for most of her years at SFU, she started all 39 games in which she played during the 2010 season. Coach Mike Renney praised Nicola for a masterful job in handling the Clan pitchers during the entire tournament. In his opinion, Renney stated that she was the tournament’s MVP. There was much “pitching by committee” and Nicola performed admirably. Nicola stated that the pitchers and catchers worked really well together throughout the tournament, with much discussion before every game. SFU’s 4-3 victory in the final game ended on a dramatic note with the third out registered at home plate. A perfect throw from left-fielder Jessie Harris allowed Nicola Collicutt to place the breath taking, game ending tag on the Oklahoma City runner attempting to tie the game. 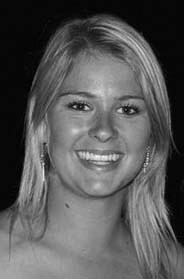 Nicola Collicutt graduated in May 2011 with a Bachelor of Business Administration degree (Human Resources Management). In her final year, she was regarded as a very capable receiver, recording 108 putouts, a perfect 1.000 fielding percentage on 123 chances, commit- ting no errors and picking off 2 runners. She handled pitchers well with an excellent ability to interpret game situations – all valuable skills for the position that she played. At present, Nicola is working and plans to spend some time travelling.